I had heard of Taquile Island on Lake Titicaca and I wanted to go there. Lake Titicaca is a vast expanse of deep blue water straddling the countries of Bolivia and Peru in the Andes Mountains. The only way to Taquile Island is a trip by boat that takes several hours. Once on the little boat we bumped along the surface of the water at the unusually high elevation of about 3800 feet. The cold wind whipped around, as we lay up on the deck in the sun, gloves and coats wrapped tightly around us and our cold chapped faces basking in the warmth of the sun. We’d arranged our accommodation with a local family. This included the room, dinner and even breakfast. Our hosts Gabriela and Diego met us at the wharf and took us to their small mud and wood cottage near the town square. It was very basic. Very. This is an Island where men knit, it is an essential skill if they are to navigate the emotional landscape of their lives. If they cannot knit they may never marry. They begin a life time of knitting after learning from the age of around 8. A hat that is almost entirely red indicates they are married, while a hat with a white panel means they are available or with a change of position it can indicate they have a girlfriend. Women judge their manliness by the quality of their knitting. They must present a magnificently looped specimen to their future father in law before they are able to marry. To compliment their hats they wear nifty black home made pants and a white shirt with a colourfully woven cummerbund. Women spin the wool, collected from the sheep farmed on the island to make the various handicrafts. They wear colourful skirts and long sleeved tops in pinks and reds and shawls of black or multi-colours. These shawls sport pom poms in red and various multi coloured mixes to show their marital status. Red for married and multi-coloured for not. This isn’t the only quirky cultural turn of events here on Taquile, by a long shot. Couples cannot marry until they have lived together with the parents for two years. If this relationship works then they are given permission to marry, if it is seen as unsuitable they must separate and find someone else. A great idea as far as I am concerned but with only about 2000 inhabitants on their Island, I wonder if this becomes a problem. We are delighted to witness a wedding, where 15 couples marry in the main square at one time, saving money for the families by sharing the celebrations. There are no cars on the island and the altitude makes it very hard to walk up to the highest point of around 4000 ft to the lookout. There are stone pathways built with rock walls and terraced fields mainly for potato growing and to keep sheep within their confines. The walk really knocks the wind out of us and we are both feeling quite unwell. The sun just seems so unusually hot and feels a bit stingy on our faces. We’re used to the cold high altitude winds chapping our skin after travelling around Bolivia for weeks on end, but today the sun seems particularly harsh. We figure it is time to rest but our faces don’t feel any less chapped and stinging even while indoors. There is no mirror or indeed bathroom in our rudimentary hut and we discover by looking at each other that we are both hideously sun burnt and our sore faces are starting to blister in large bubbles that burst easily after we lay down for the night. We cannot venture outside again without being completely covered from head to foot. We spend a lot of time in our dark little haven looking out the tiny window to the blue lake. 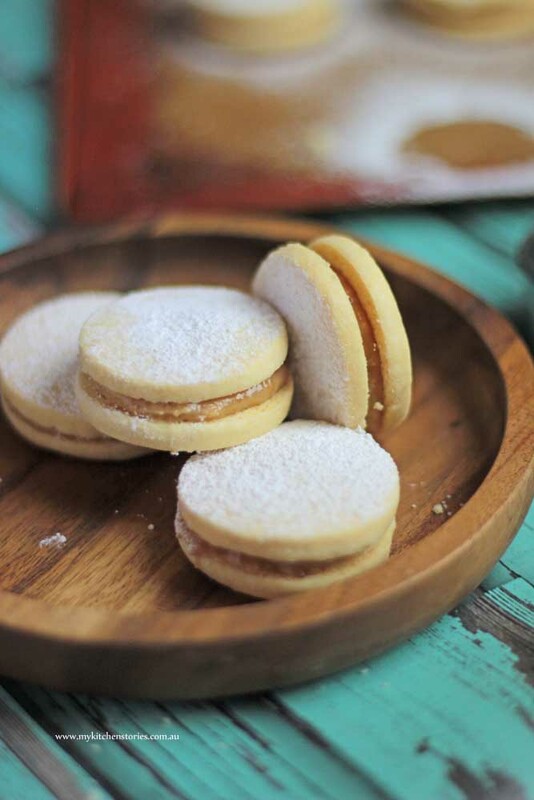 We have a stash of addictive little Peruvian snacks called Alfajores that are filled with caramel that we feast on, eating them half at a time to make them last longer. 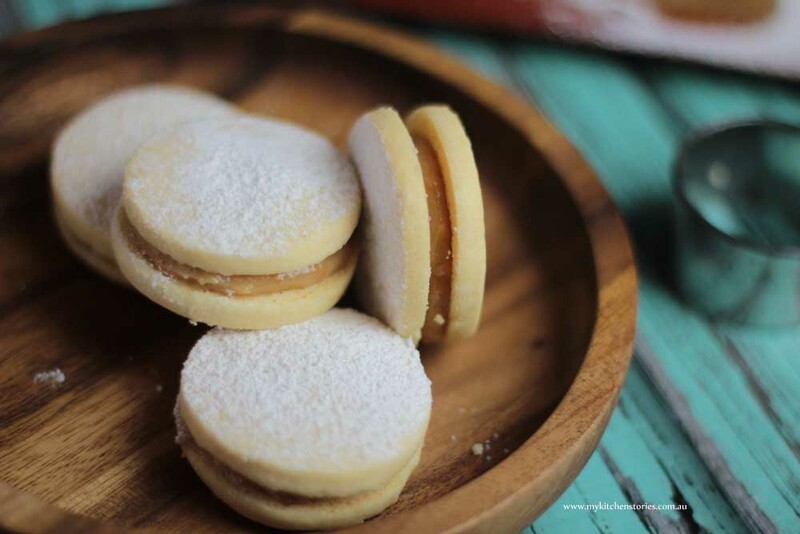 The crumbly shortbread’s are popular all over South America and we are in heaven and hell at the same time. These little treats are our saviour because the food from our hosts is a repetitive dark brackish bean stew, brought to us in wooden bowls by the light of a candle. We are able to venture out again after a day with our faces well covered but the flaking peeling skin means people stare. The sun is particularly hot and dangerous at high altitudes and we just didn’t realise that we probably had sunstroke. 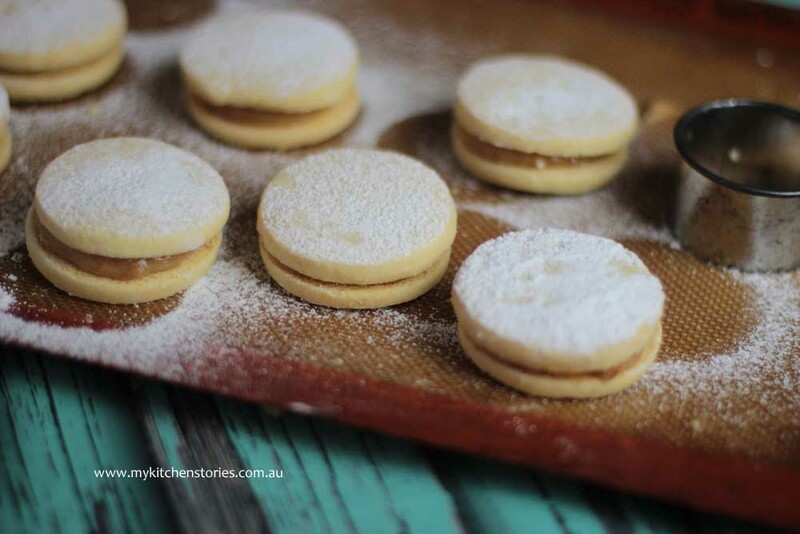 These easy sweet and crumbly biscuits are a favourite in our house even now. We can whip a batch of these up in a short time and they will always remind me of the snow-capped Andes and the knitting men of Peru. My son loves them and knows the story well. When he was little we called them the sunburn biscuits. Thanks to Sara ( belly rumbles) for introducing me to this new oven roasted way to make caramel. Instead of boiling for hours we just pop it in the oven, that is on non-stop anyway. You will need : To set the oven to 150 Deg C, a flat baking tray, a rolling pin and three pieces of baking paper, a container to cook the milk in and a water bath. 1 round cutter approximately 6 cm. Put the flour, corn flour, baking powder and pure sugar into a food processor and blitz. Add the chilled butter and whizz till it looks like buttery crumbs. Mix the vanilla and the egg and pour into the food processor while it is mixing. Mix till it is combined and gathers into a ball. Roll the dough between two pieces of paper till evenly spread to about 1 cm thick. Put onto a tray and chill till very cold. Bake at 150 deg C for 10-12 minutes. Make sure they don't colour because these should be snowy white biscuits. Fill a small piping bag with cold caramel or spread the caramel thickly and sandwich two biscuits together. Sprinkle with icing sugar, store in an airtight container if there are any left. Some people prefer them the next day as they soften. Ha you are so funny. 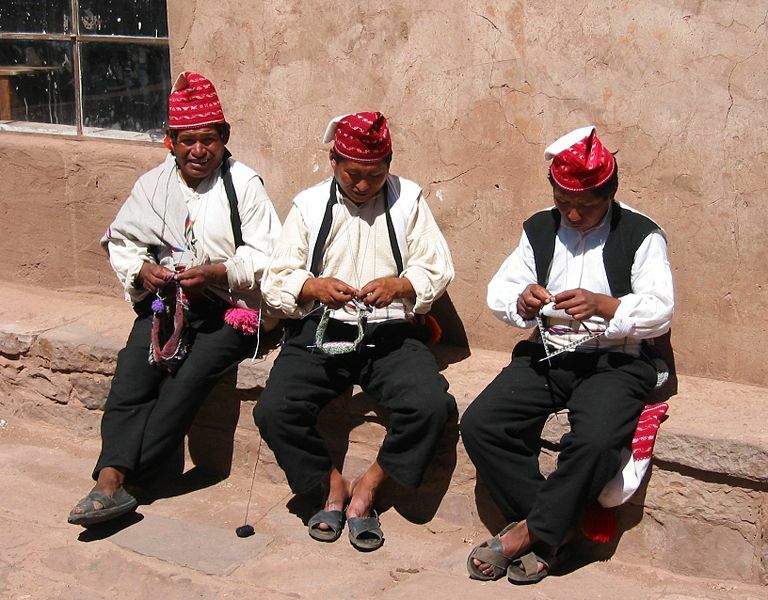 Great story – Tania – very interesting – knitting is done by men in a number of cultures. Some cultures think women aren’t skilled enough – yeah right! The biscuits look delicious. Oh wow I didn’t know that about the knitting…..typical! What a great trip and experience! These caramel sandwiched cookies look droolworth. What a lovely story, and great biscuits to take you back there! The sun really can be a harsh thing. It sounds like an amazing visit though. 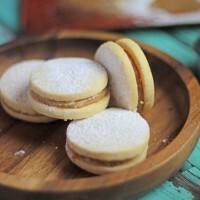 Oh how I love alfajores. I think they were my favourite thing in South America. So so delicious! Wow, what an interesting story, and recipe! Love your photos too! The oven method is the only one I use for making dulce de leche. It is much less stressful that way! Oh no Charlie. That is only a story that you could tell. Photos please…..
What a memorable trip, I would love to travel to that part of the world one day. It certainly is a fascinating place to go. Oh what an incredible story to be able to tell, I’m sure not so enjoyable at the time but how fabulous not look back on those memories. I love how other cultures socialise and function it’s totally intriguing isn’t it. 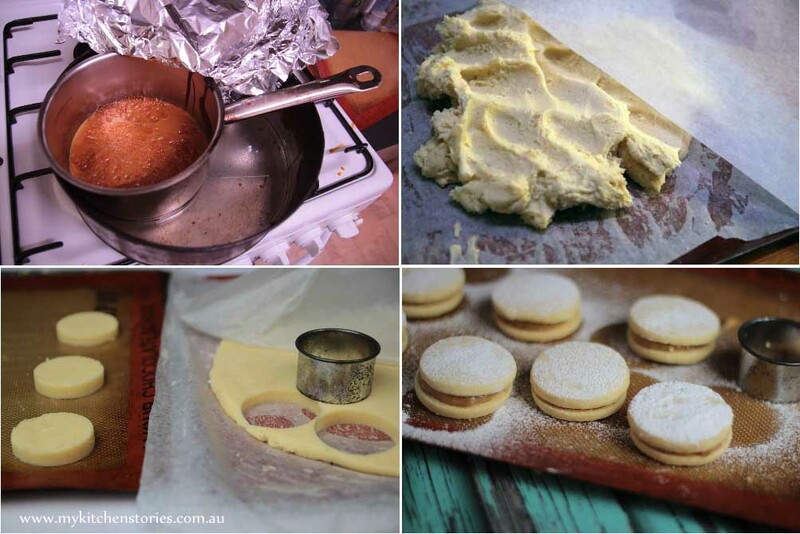 Those biscuits look amazing & really straight forward to makes & the idea to simply oven bake the condensed milk for dulce… Genius! 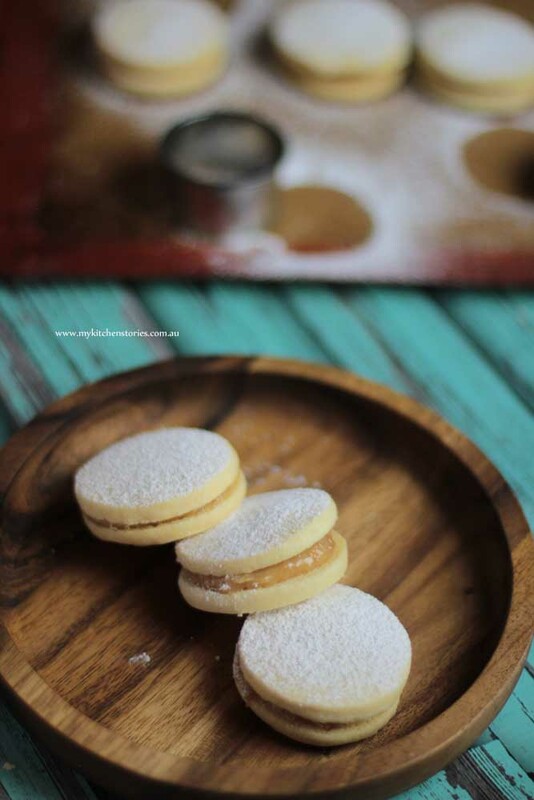 Those little biscuits look good enough on their own but sandwiched together with dulche de leche….. amazing! Wow amazing! I can’t wait to try these! They look so sweet. What an interesting oven method! I’ve never come across it, should give it a try. Thanks! what perfect cookies! these are flawless in everything from appearance to components–bravo!